1. Preheat the oven to 200°C/425°C/Gas Mark 6. 2. Place a flour tortilla inside 4x11cm (1½x4½in) mini spring-clip cake tins, make into bowl shape and place on a baking tray. 3. Cook for 5 mins until lightly browned, then leave to cool and crisp a little in the tins. If you don’t have any tins, form crumpled foil into bowl shapes and bake the tortillas over these. 4. Cut the chicken into long thin strips, 1cm (½in) wide, and place in a bowl. Pour over the lime juice and season with salt and pepper. 5. Heat the oil in a large wok or non-stick frying pan over a high heat. Stir-fry the chicken, onions and peppers for 5 mins or until lightly browned. 6. Mix the ground cumin, coriander, oregano and chilli powder in a small bowl and sprinkle over the chicken and vegetables. 7. Stir-fry for a further 1–2 mins or until the chicken is cooked through. 7. 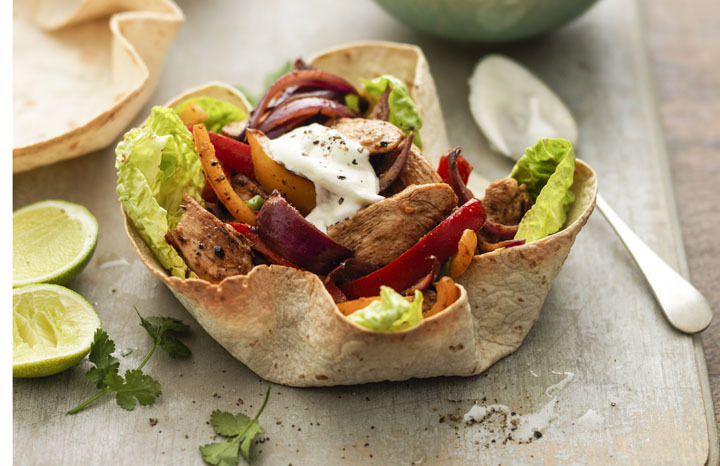 While the chicken is cooking, line the tortilla bowls with lettuce leaves. Pile the hot chicken and peppers on top, then spoon over the salsa if you like, and soured cream. For more recipes see Yours magazine, out every fortnight on a Tuesday.